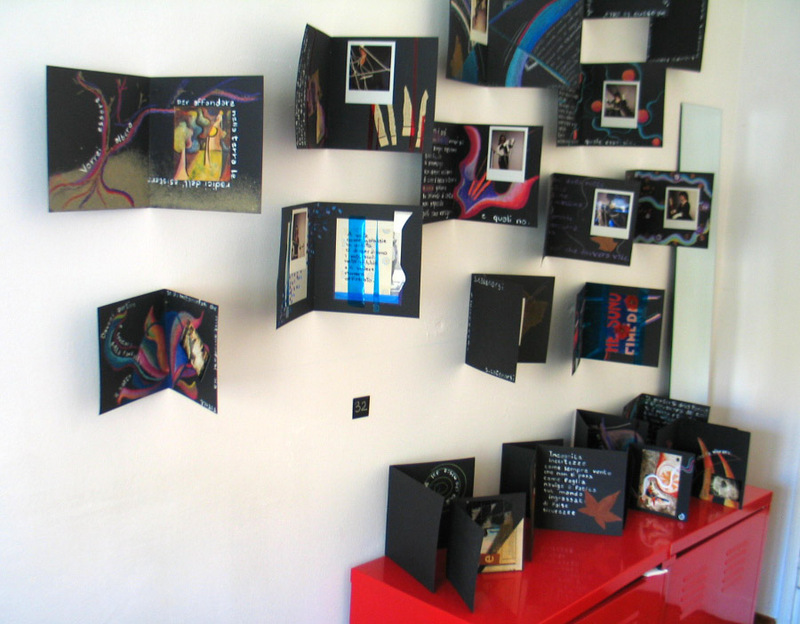 The first period of my installative works started mixing my previous painting with my and poetry. 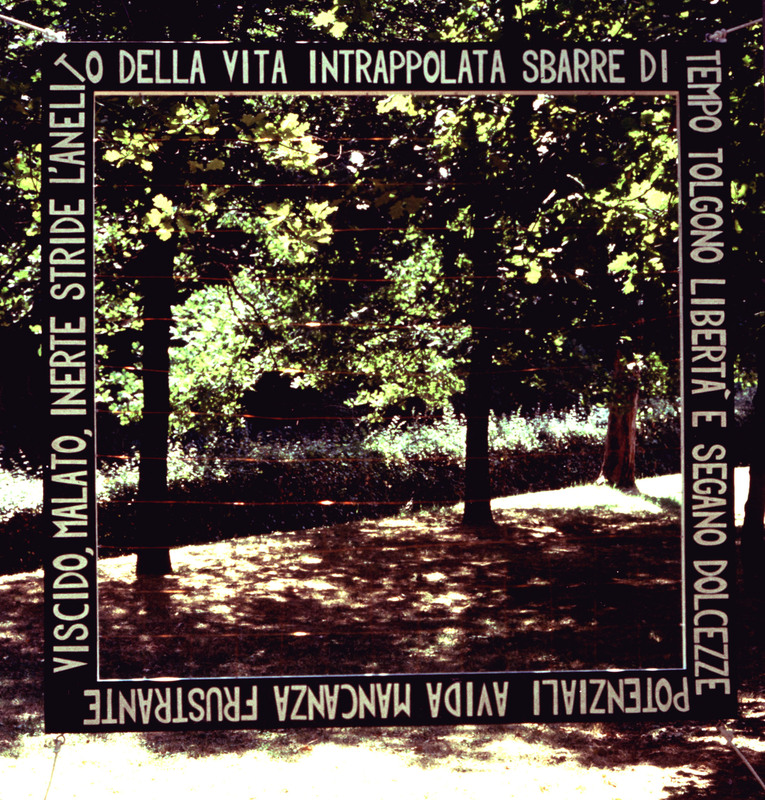 I gradually went in the direction of eliminating and simplifying, which led me to a rigorous research of synthesis, and to rather conceptual works (Viscido, Il linguaggio falta qualcosa, No war …) where the pictorial image gradually disappeared to give space to words as form and color as a symbol. 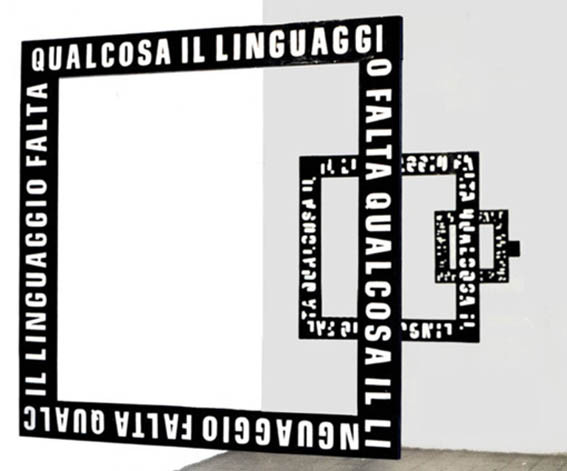 It is not ‘visual poetry’, because it doesn’t assemble poetry and image fr themselves. If anything, it is poetry that is embodied, it becomes an object and it lives of its autonomy. It is not even ‘conceptual art’ itself, because, while it defines the idea and directing its meaning, the aesthetic and sensorial side has its importance. 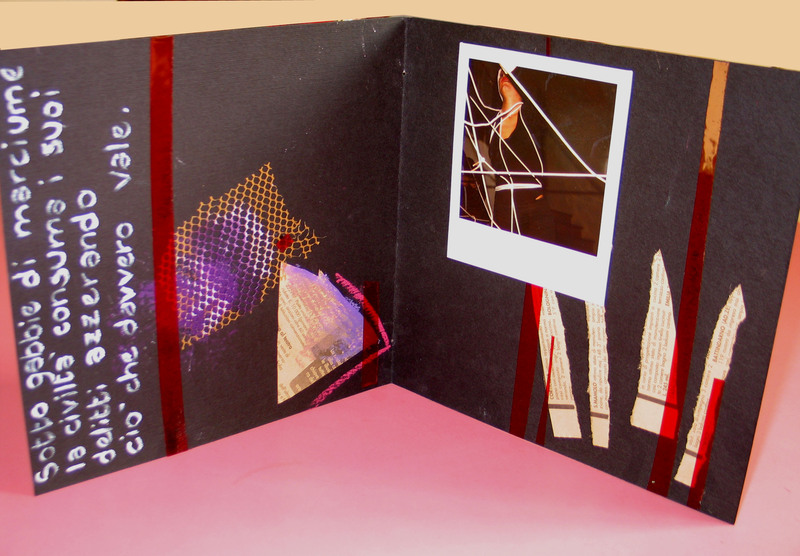 At a later stage I felt the need to regain possession of color and pictorial practice, which still belonged to me but they were excluded from the harshness of the previous projects. 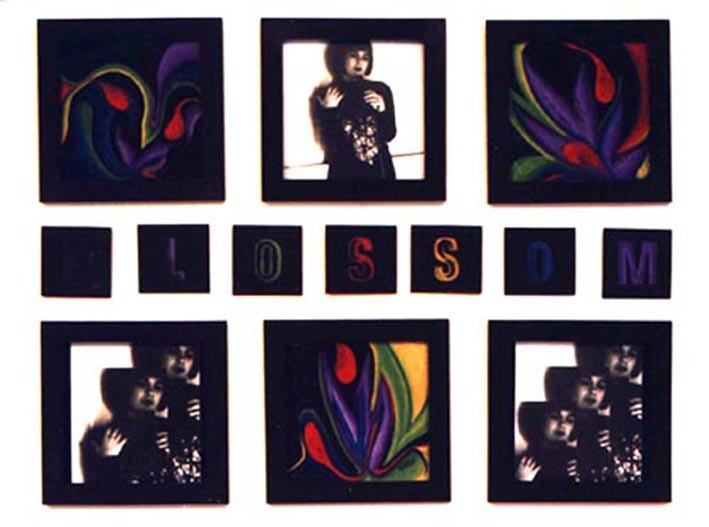 This gave rise to the works of the series called Blossom, where conceptual ideas, words, space, photography, painting, color, and other materials contaminated and integrated. 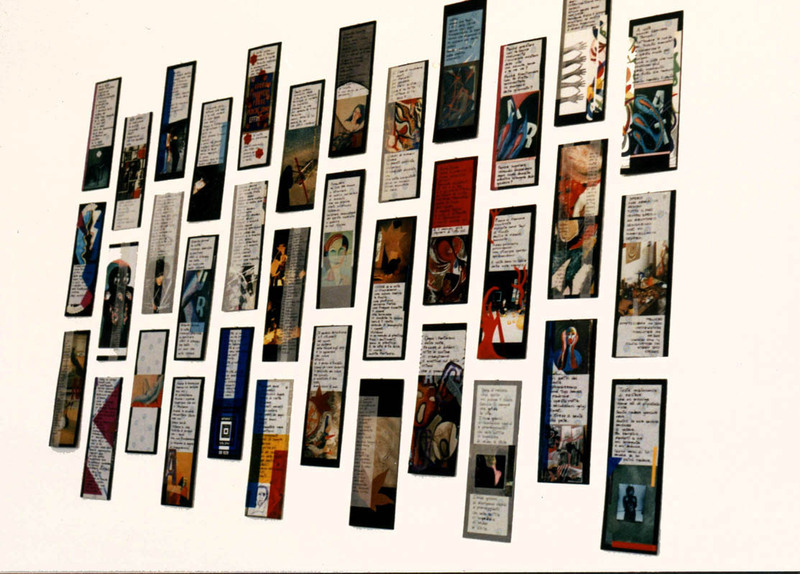 Thet could also seen defined as ‘narrative art’, where all the pieces tell messages and belt references to each other, even if they live their own life. 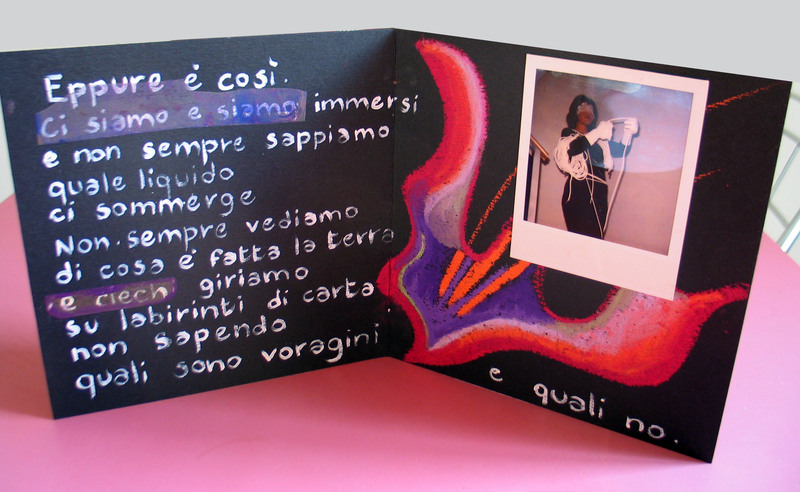 In the series of Fiammiferi (Matches) and Farfalle (Butterflies) this contamination and this circularity is more accentuated, by inserting in the works some the creative elements of past works (whether paintings, poems or performances), used in the same way as other materials such as color, gauze, sand and acetates. 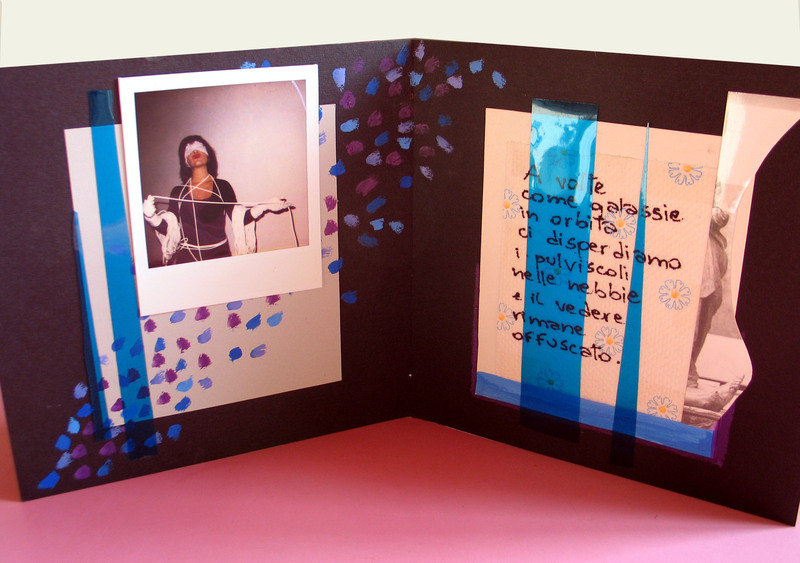 This is also a conceptual operation, it’s the act of connecting the present whith the past, supported by a’ physical labor ‘ which takes effect in the act of choice and renews discovering values and additional meanings. 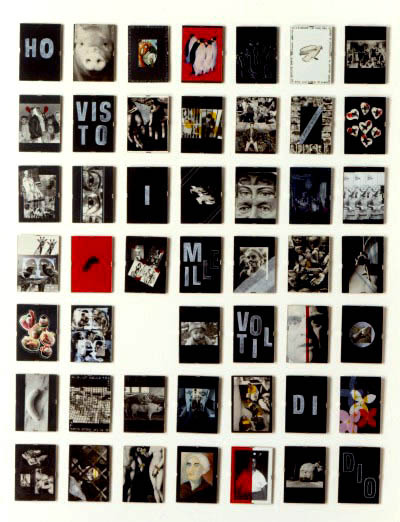 Ho visto i mille volti di Dio (I have seen the thousand faces of God), 1998, is an installation of 48 pictures composed with newspapers, collage of various materials, white pencil, acrylics and photographs, reflecting on spirituality and on the overcoming of the concept of religion as narrow and dogmatic. 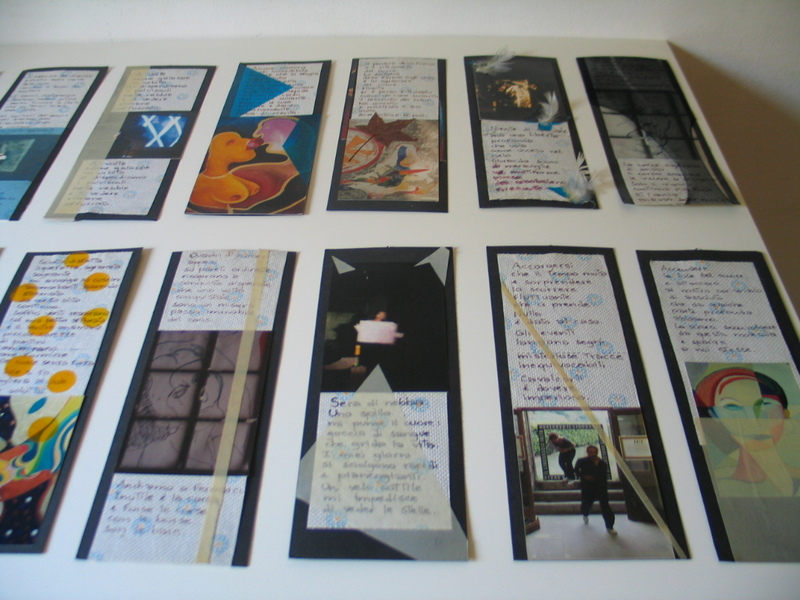 I work on unity of multiplicity. It ‘a search for unity at multiple levels and in multiple ways. First of all it is a search about unity of languages, the union of different expressive media which cooperate to give a final synthetic message. It is not just pure linguistic and formal research on the concept of integration and synthesis of different disciplines, multimedia and synaesthetic work in and of itself; or rather, it’s not just that. The combination of many languages and media arises from a bottom inner need. A need because creativity for me is implemented and takes place in different ways and with different nuances: sometimes comes out with forms and colors, some others with words, other times is embodied in a performance project, others flowing in the space and music. Not everything that I do want to express is possible with the same creative language; not all the variety of what I would like to talk about adapts to remain locked up in the specific objective limits of each language. I often had thought, and for many years, if I should abandon this versatility to fully concentrate on only one kind of language and media, in order to delve into the deepening passionate and constant road. But I did not want to be identified in one thing or in an activity, or be inserted into any boxes. I realized that if I would ever abandon painting, or writing, or performing it was like suppressing a vital need, a part of myself. And that’s not good, either in life or in art, which is the intimate expression of personality in its entirety. My research is therefore not only about language and on one in particular, but on the whole operation, the depth of what I want to express. Different languages have the potential to be used in cooperation to lead to a global message. What interests me are not merely the media I use, but the result. The unity that is the basis of my research is not only unity of languages and profound unity of the person. It’s also search for the unity of time, between past, present and future living inside the same work. The past of the events that have been lived, objectified through signs created in the past (poems, pictures or performances) that I include in the work to relive in the present and to build a new future. Why the performance? What led me to start this process? The performance is an expressive art form open to endless possibilities. That’s mainly why one day I felt the need to use performance as a unifying crucible of the various languages and expressive paths that I brought forward, especially the world of visual arts and that of poetry. I began to create performances where in addition to words and images I could insert music, body language, voice and endless other possibilities of expression. The idea of Multimedia and of cooperation of different languages is however not an end in itself, but is in terms of bringing art into life and to bring life to its original location, pulsating unity and love. Performance is for me not just a formal experiment but it is a means of spiritual recognition, to transform, as Beuys believed, people’s lives. Direct contact with the audience also enables the performance to be vehicle of energy and feelings. My goal is to provoke emotions, create a spell, create a different space from the one of every day lige, where you can enter a personal dimension which is truer and deeper. I also believe that art should get out of the confined space of the art world and try to reach a wider audience, presenting itself in different contexts, not only in the institutional spaces for art. My performances are intended to speak to the others, and therefore not only to professionals, but also to people who do not usually attend those environments of the art world. Art in this way has a social purpose and it’s an alternative to the world of cultural consumption whose sole purpose is the achievement of fame and wealth. Since 1993 LIUBA has been worked with performance art, and all the projects on this website are comèosed by performances by works derived from them. Those wishing to receive LIUBA’s updated performance portoflio can request it by writing in the ‘say hello’ section, just below, or sending an email.